The Space Wolves, those fiercely loyal and dependable Space Marines are sent to Propsero to enforce the Emperors justice after the Primarch of the Thousand Sons chapter makes a serious mistake that puts the safety of the very birthplace of humanity at risk. The events of this story run parallel with the Dan Abnett novel Prospero Burns - set within the Horus Heresy and packed full of vibrant, energetic and descriptive battles. Where Dan Abnett's masterpiece examines the Wolves, here we get the other side of the conflict and explore the Thousand Sons. The version reviewed here is the audiobook, which features the powerful, commanding voice of Martyn Ellis and is contained on 13 CD's with a running time of around 16 hours. The story itself is pure Warhammer 40k, from the atmospheric sound effects to the dark and dramatic conflicts, everything feels just like it should. The legion is described in exquisite detail, from the history of the chapter and the strange warp powers they possess to the dramatis personae and the relationships between them. The plot is finely honed, has a number of dramatic sub-plots and features plenty of action. The author does a great job of tying the story in with Prospero Burns without repeating the same information and I felt this was handled very effectively. The author also does a commendable job of describing the Thousand Sons' descent into darkness, detailing how the little actions and events move them from the emperor's path and onto the road to Chaos, essentially doing the wrong things but for good reasons. The characters are vividly drawn and really do capture the imagination, drawing you into the story while the fight scenes are tense and graphic without going over the top. 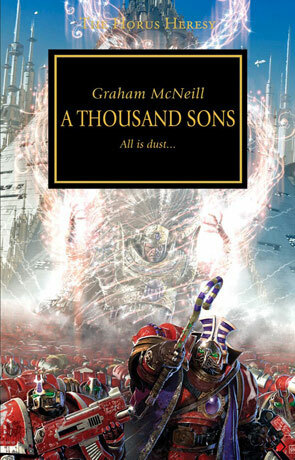 This is Warhammer 40k at it's very finest and it's one of the best stories written so far in the excellent Horus series. I would however like to see a bit more of the renegade warmaster himself, I can understand that Black Library are probably saving him for later but still a little more screen time for one of the most important characters of the series wouldn't go amiss. It is a stroke of genius turning these stories into Audio books, in a way the already brilliant prose is brought to life even more by the inclusion of a good narrator and Martyn Ellis does a superb job an unmissable part of an unmissable series. Written on 6th August 2012 by Ant.